Years of use here. Solid email app. New version has larger MB installer, but if you uncheck the Pro features, it is still light as a feather, and only uses about 7mbs of memory in the background. Excellent- Basically an email notifier, Pop Peeper is fit to serve as an email client as well. I use it as a notifier hence as a filter tool archiving spam before deleting it hence preventing my email client from being polluted with trash. Handles all email protocols. The v4 beta has been out for well over a year now, and this guy's only just put out 3.8.1.0? Nonetheless, I use this all the time, it's basically the best multiple mail account checker available. That GM sh1t that you wrote is one big TURD! Go cry. You will never have a program like PP. bloat bloat bloat bloat. Gmail Notifier Plus is so much better. I don't want all this crap, I just want to check my email! Best email app on the planet! Truely one of the greatest in software history. Been using this since the early days. And I just purchased the premium addon pack today. I downloaded this application thinking it would be just another piece of digital crap, mainly because I've installed thousands of applications over the years, and ... oh I'm just spitballing here, but probably 95% of them are crap. However, this is a great application, especially given that it's free. Nice interface, nice customizability, nice everything. In fact, the only thing I need Thunderbird for anymore is when I want to save a message long-term. Other than that, for sending/receiving, this is it. Still the best and still free! Worth donating! Outstanding utility for monitoring multiple email accounts.Small (under 2MB), fast and portable. 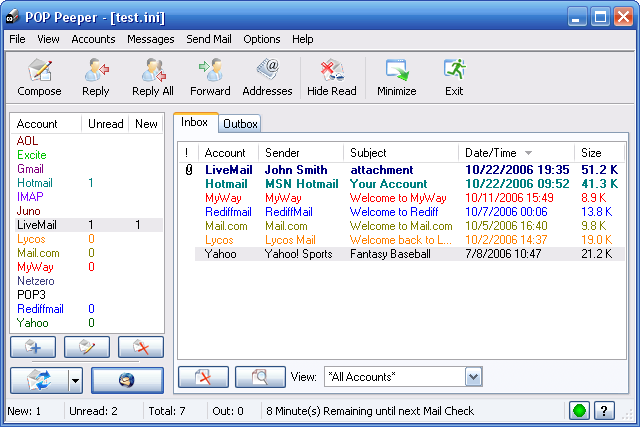 Has e-mail preview feature or can launch your e-mail client by default. This is NOT an email client. 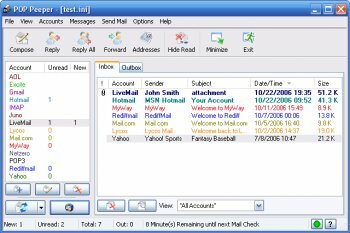 It has a very, very basic email client built-in but it's main purpose is to periodically check all your email accounts, alert you when you have new messages and view their header information. This is my favorite part since I can tell from the header if it is spam and delete it without having to load my Email client. Yes I use Slypheed too and it is an excellent email client but I prefer to leave POP peeper running in the system tray since it is light on resources and run Slypheed when I need to read/reply to messages. Works very well for me with the multiple accounts that I have set it to check. No issues found and great functionality. It it the best there is period.